Providence, RI (6/3/2011): The Rhode Island Reds Heritage Society has announced it will now offer to the general public the purchase of a replica of the commemorative plaque that stands at the site of the old R. I. 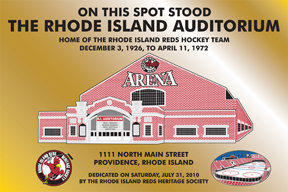 Auditorium, 1111 North Main Street in Providence, home of the R. I. Reds pro hockey team for 46 years. The plaque is a 6” by 4” exact replica of the larger one dedicated at 1111 North Main Street last July 31, 2010, and presents precise images of both the exterior and interior of the old “Arena,” built in 1926. Plaques are mounted on a wood base, suitable for desktop display, or can be framed for wall decoration. Cost is $100 per plaque and includes packaging and handling. R. I. residents should add state sales of $7. For further information, please call Mal Goldenberg at 401-864-6191 or e-mail mal@rmcri.com. To download a copy of the order form, click here. The plaque measures 6 inches wide by 4 inches high, etched on solid brass.